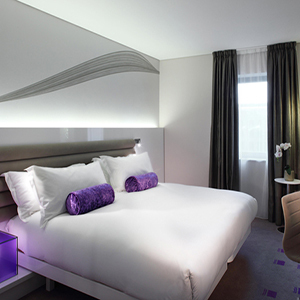 The Morrison Dublin - a DoubleTree by Hilton Hotel is one of the luxurious hotel in Dublin Ireland. This Hotel is located right at the center of Dublin City. 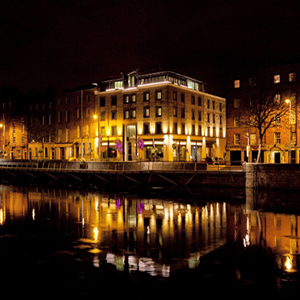 The 4 star Morrison Hotel, a Double Tree by Hilton, is located in the heart of Dublin city centre, Ireland. It is situated on the banks of the River Liffey, and only minutes from the lively quarter of Temple Bar, Jervis Shopping Centre and many more of capital's attractons. There is a Luas station located behind the hotel as well. The stylish Morrison hotel's 145 spacious and modern rooms include free Wi-Fi, a 40-inch, flat-screen smart TV, a minibar, tea and coffee making facilities and an en suite bathroom with a hairdryer. Free wired internet is available in rooms. The award winning Morrison Grill at this hotel offers exciting culinary experiences created with the very best of country's produce. It is one of the best restaurants in in Dublin city centre and diners can feel relaxed and enjoy comfortable surroundings overlooking the river Liffey. The Josper at the hotel is an indoor barbecue oven and cooks a variety of meat and fish at over 500°C. The 4 star luxurious Morrison Hotel, a Double Tree by Hilton in Dublin city centre features the popular, cool, contemporary destination place, Quay 14 where an extensive drinks menu, specializing in cocktails, whiskeys and local craft beers are served. The Quay 14 bar at the hotel hosts "Live at The Morrison" which takes place each and every Friday and Saturday night. Guests can enjoy a hand picked selection of raw musical talent, brought to you by up and coming artists. Our house band begins at 21.00. This hotel in Lower Ormond Quay, Dublin 1, Ireland, is just walking distance away from the Dublin's nightlife and entertainment places such as Temple Bar, where there are live music every nights is many venues. Also city's major music venues such as 3Arena, Bord Gáis Theatre, Olympia Theatre and many more are in proximity with the hotel. This centrally located 4 star hotel is ideally located in close proximity with Dublin's major sport venues such as Aviva Stadium and Croke Park, also guests can watch all sports actions live as they are televised. There is an on-site fitness centre at the hotel, which guests can use for free. The hotel offers a wide range of meeting and conference spaces and facilities ideally located in central Dublin, where meetings of 2 delegates right up to 240 delegates can be accommodated. The facilities are offered to cater for meetings, conferences, trainings, seminars, press & product launches and private cocktail receptions.